Production notes: Toyoo Ashida served as the art director for this episode. He would go on to direct a lot of anime in the 1980s such as Yamato III, Dr. Slump, Vampire Hunter D, Fist of the North Star, and many more. It was around this time that the in-house artists at Office Academy began forming individual studios that continued to work on the series. Episode 5 also saw the first participation of a group called Studio Mates. The narrator for the first four episodes (in Japan) was Masayuki Kimura, and despite his name appearing in the credits for episodes 5 and 6, he was replaced in those episodes by Masato Ibu, the voice actor for Dessler and the EDF Commander. He probably did this as a last-minute fill-in with no time to change the end title credits. The Argo is cruising along when it suddenly lurches to one side. Venture can’t regain control. Sandor immediately assumes that there’s some hidden damage that wasn’t fixed, but Orion reports that there’s a problem with the engine. (Note: in Yamato, Tokugawa calls down to his assistant Yabu for information. Yabu will later be introduced in Star Blazers as Sparks.) Actually, If Sandor wants to find a problem, all he has to do is look to the front of the bridge–while he was talking to the Captain, almost the entire front bridge area was missing! Nova then reports that the ship is “being acted upon by an extra-strong gravity force,” identified moments later as Jupiter. Note: You can go to the Fourmilab website and plug in “2199-10-08” in the date field to see where the planets will be during this episode. Obviously, the show’s writers didn’t have access to this data in 1974, and were probably taking their cues from the plan for Voyager’s “Grand Tour” of the solar system. The Japanese version has the narrator take over for a few lines, describing Jupiter: solar year (12 Earth years), mass (300 times the Earth), volume (1000 times the Earth), possible solid matter composition (“pasty liquid hydrogen and hydrogen metal”) and the contents of the outer atmosphere (ammonia clouds). Yamato also shows us a few lingering shots of the gas giant, all of which speaks strongly of the staff’s fascination with space science. Star Blazers gives us the Kindergarten primer by Captain Avatar: it’s “many times the size of Earth” and “covered with gasses that could be poisonous”. Sandor is emphatic that the Argo not fall into the atmosphere. However, with the engine working at less than full capacity, there’s no escape, and soon the ship is drifting in. They must have landed in a relatively calm region–they don’t seem to be buffeted by fierce 400 mph winds. Nova soon detects a huge object on her radar. In a few moments, the mysterious object starts to appear through the thick haze–a huge chunk of land floating in the Jovian sky. “A floating continent” as the Captain dubs it. This is probably one of the weirdest concepts put out there in Yamato. There’s no explanation for it, it’s just a large floating island in Jupiter’s sky. It has thick jungle-like vegetation growing all over it. Giant stalactites hang from the underside. The most information we’re given about it is from the narrator in Yamato, who says it floats in a fixed orbit in a “sea of methane” and is about the size of Australia, but no clue as to its origin. There’s a first attempt at the famous “Yamato flyby” here. I’m referring to the stock footage in which Yamato starts as a small point in the distance, getting bigger as it gets closer. It passes close enough to fill the frame with its “waterline” for a second, then recedes into the distance. They’ve shown us the beginning and ending of it a few times already, but this is the first time they try the whole shot. This first take isn’t too good, as the cel depicting the close-up point stays onscreen a little too long. This brief scene is left out of Star Blazers. Production note: This scene was one of several “bank scenes” (stock footage) assigned by director Noboru Ishiguro to some of the most accomplished animators. Knowing they would be used over and over, he foresaw this as a cost-saving measure for future episodes. While envisioning this particular shot, he inadvertantly created the most lasting image of the ship with its hyper-inflated bow looming toward the viewer. Correctly resolving it in three dimensions would give modelers headaches for decades to come. The Argo almost drops under the continent, but Venture strains on the yoke and manages to get the ship to pull up so they can land. While Star Blazers shows Venture pulling back on the controls, they took out the scene of the ship, with its atmospheric cruising wings extended, actually pulling up. This sequence is much clearer in Yamato. Inside, Orion reports to the Captain that the problem is the Energy Storage Unit (instead of the Energy Transfer Pipe) but promises that they “can fix it in no time.” This says a lot about Orion’s skills, since it looks as if the entire engine room is in full-on meltdown. In Star Blazers, there’s an extremely obvious edit here. The fighters fly around each other again, the same scenes used just seconds ago, and then Wildstar breaks off, spitting out an angry “Got away this time” to his foe. The Yamato version shows us Kodai (Wildstar) shooting off the Gamilon’s starboard wing. Spinning out of control, the enemy lands at the edge of the continent. He tries desperately to stop himself from sliding off, but the ship drops into the depths of Jupiter’s atmosphere. Kodai salutes his vanquished adversary and flies home. Soon, a couple dozen missiles are launched from the Gamilon base, arcing over the continent towards the Argo. Orion announces completion of the repair work on the Energy Transmission Unit (is that the same thing as the Energy Storage Unit mentioned before, or did something else break?). Avatar orders an immediate takeoff. Since starting the engine took such an effort the first time (episode 3), I think it’s safe to assume this wasn’t a “cold start”. The WME’s pilot light was still lit, in other words. The Argo just barely avoids the missiles. As soon as the ship is in a relatively safe orbit in the clouds, Avatar orders the helm to be given to Dash (oops, he means Eager, of course. He’s still learning the crew names!) and has the rest of the bridge crew meet him in the Operations Room (which I think is the same as last episode’s Central Strategy Room). In the Operations Room, Avatar tells his officers that he wants to make one attack at the base before they leave. Wildstar sees this as the perfect opportunity to test the Wave-Motion Gun. Venture and Sandor both vote against the idea, Orion argues for it. (Orion, with his beard colored darker, gets an extra line in Yamato.) Avatar sides with Wildstar and Orion. Avatar explains that the Wave-Motion Gun uses the energy of the Wave-Motion Engine–comparable to the energy of a small galaxy(!) in Yamato–so it’s an extremely powerful weapon. The drawback is that the energy drain on the ship leaves them defenseless for a brief time before and after the firing. This scene is beautifully done, with the whole room awash in green from the floor video panel. I particularly liked the shot from under the floor display panel, looking up at Avatar. If there is one problem with this scene, it’s the use of the wavy “ripple glass” effect. The floor display shows a detailed cross section of the Wave Motion Gun that is maddeningly obscured by this effect. The commander at the Gamilon base sees that the Argo is approaching. In Star Blazers, he orders an evacuation, and then we’re shown one solitary fighter take off (the same fighter Wildstar fought with earlier.) No such evacuation order is given (or shown) in Yamato. The Wave-Motion Gun starts to charge up. Nova checks her radar screen and gives Wildstar the location of the base as Venture surrenders control of the helm. They really need new radar screen animation. Nova’s radar bubble only ever shows one blip in the upper right hand corner, regardless of what she’s detecting. The same return can mean floating continent (twice), multiple missiles, a single Gamilon fighter, or an enemy carrier. Moments later, the Wave-Motion Gun is fired. There’s an animation mistake here. The camera is supposed to follow the trail of Wave-Motion energy, but someone neglected to remove the cell of the Argo from the background, so it looks like the beam bends across the front of the ship. There also seemed to be some confusion about where the Argo was located. The scenes before the firing made it look like the ship was still in the atmosphere. However, there’s a brief shot of the ship firing the WMG from outside Jupiter. These are all red flags indicating how stressed the animation staff must have been. Normally there would be time to correct and reshoot such scenes; obviously that time wasn’t there. Also, Yamato had an electronic Wave-Motion Gun sound, a buzz/hum at the highest possible decibel. The Star Blazers version added an additional organic layer to it, a bit like a horse whinny. In Yamato, they clearly show the base commander still at his post as the Wave-Motion energy starts to tear it apart. The base is utterly destroyed, followed moments later by the whole floating continent. While in radio contact with Colonel Shulz [Ganz], the base commander screams as he’s vaporized. 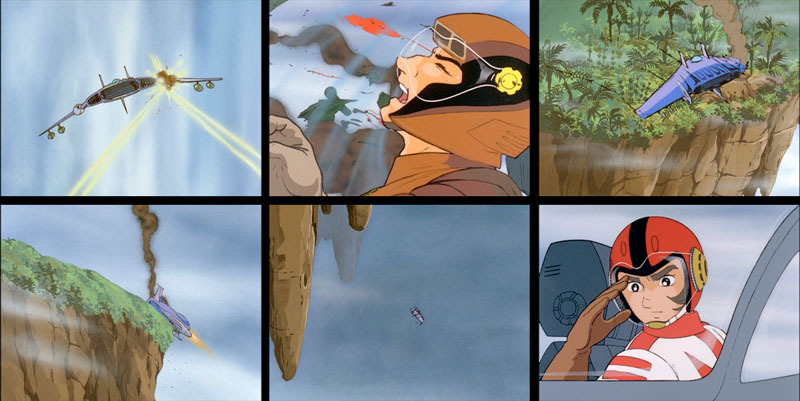 The Star Blazers edit tries to make it look like the base personnel escaped, and several scenes of destruction were removed. However, note that we see several people on the base and only one small fighter escaping. Also, due to the way this sequence was edited, the fate of that one fighter is in doubt. Although they radio Ganz that they’re OK, moments later Ganz is unable to contact them, possibly implying they were killed in the subsequent Floating Continent explosion. We turn our attention back to the Star Force. With no power, Jupiter’s gravity reasserts itself and the Argo starts to fall into the explosion. Orion tells Venture to use the “emergency override” to restart the engine. After much struggling, the Argo manages to pull up and away from Jupiter. The Yamato cut of this sequence gives more time to the ship’s escape. Also, they actually show us the characters speaking and taking action during this scene. 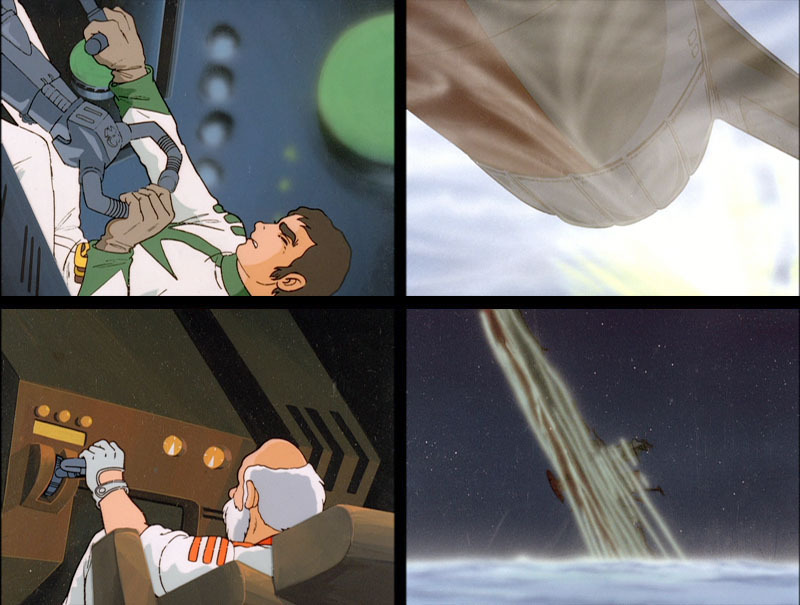 Star Blazers focuses on external scenes of the ship, and even some of those were cut out, making the escape seem a little too quick. Now safe, the Star Force reflects on what a powerful weapon they have in the Wave-Motion Gun. According to Sandor, they should have destroyed the base, not the entire continent. Avatar urges great caution in using this weapon in the future. It’s nice to see them realize what a wonderful/dangerous gift Starsha has given them in the Wave-Motion Engine. One thing I’ve wondered about though–Starsha mentioned the Wave-Motion Engine in her message, but not the Wave-Motion Gun. Was the Wave-Motion Gun suggested somewhere in Starsha’s blueprints, or was it the invention of Earth engineers? It would be kind of ironic if Earth was given this great technology by a peaceful society, only to turn it into a weapon of mass destruction! There are 361 days left. Here’s another -possible- animation error – After landing on the floating continent and IQ9 checks the exterior hull – the next bridge scene shows a *moving* starfield out the bridge window. Either the Argo/Yamato bow was pointed at such an angle to not view the landscape or the animators used stock footage.